Mystic of Holyhead (successor to Lynn Rival) - Finished? For the last 3 months we've been working on the interior. We're overhauling or replacing all the fittings and equipment. Paul has rebuilt the heads compartments in Hi-Macs. Rachel has been renewing the headlining and refurbishing the teak trims in the aft cabin. The galley is now an empty space and will be rebuilt next... At times we've wondered whether we'll manage to get back on the water this year. Now that the days are longer we're beginning to see real progress. We've drilled holes in the new teak and installed most of the deck fittings. With the pushpit and pulpit in place we now have proper guard rails again. 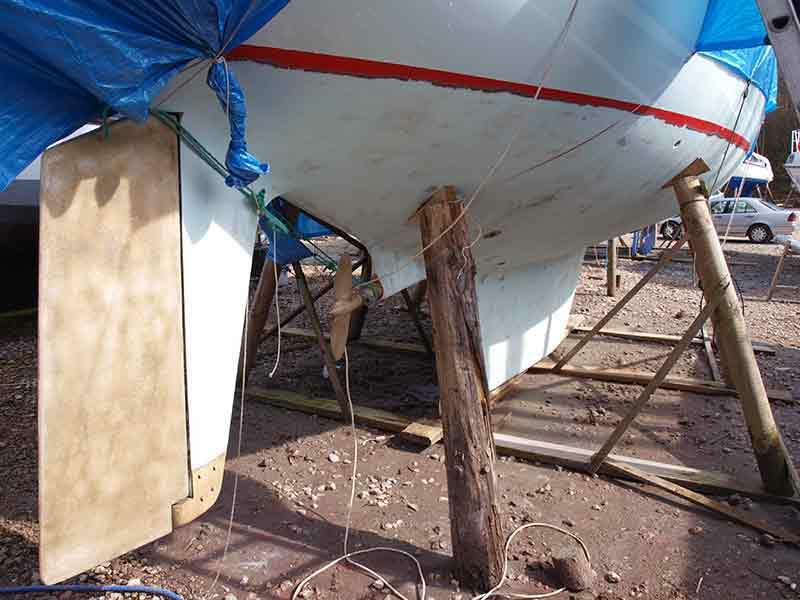 And, the bottom has been sand-blasted in preparation for antifouling. There have been a few hiccoughs, like forgetting to leave access for bolting down the port side genoa track - the challenge for Paul: how to lower the holding tank enough to access the bolts without disturbing the finished Hi-Macs panels. 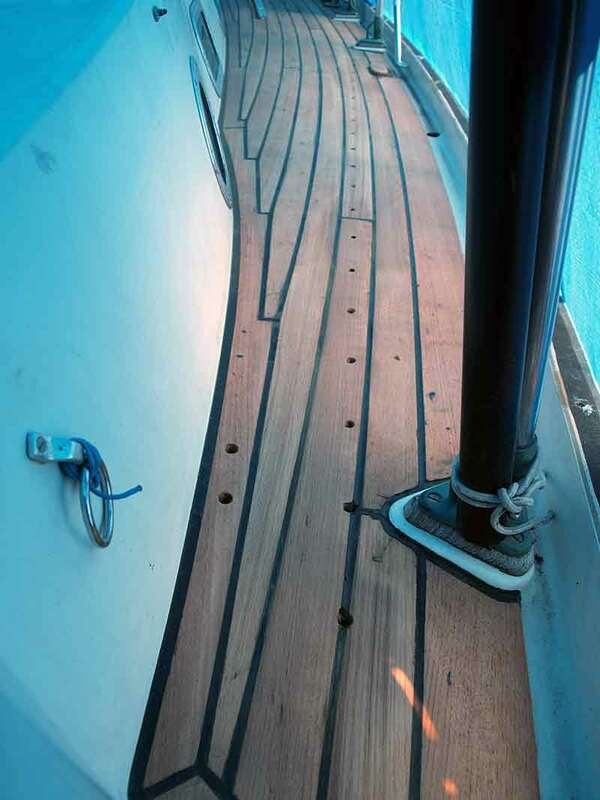 And we we have to stop ourselves getting distracted by good ideas - like cutting the companionway steps into two. But we're still hoping to get her afloat - who said finished? - in June. The list is formidable - getting the mast back up, installing the engine, antifouling, etc. - but with a bit of help we should make it. We have had a few distractions - including meeting lots of interesting people at various talks we've given - and recently attended a memorable dinner with the Ocean Cruising Club who presented us with their Award of Merit for "an outstanding voyage and achievement". 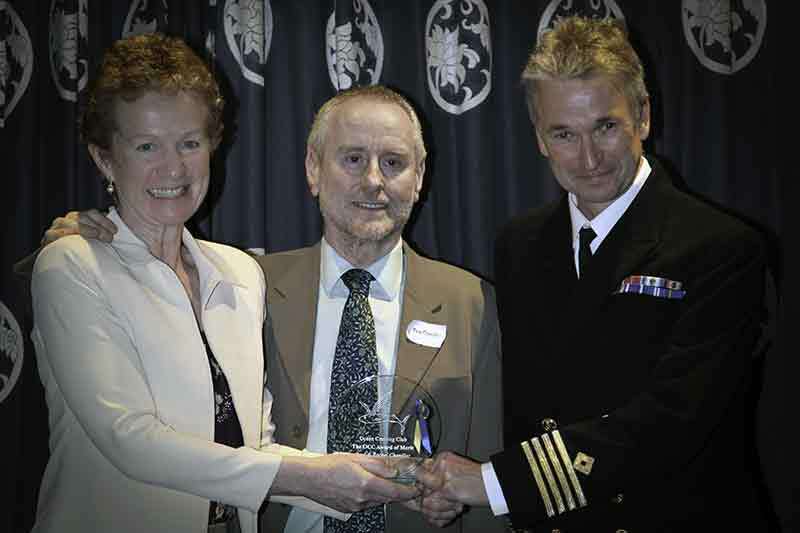 They arranged for Captain Clarke of the RFA Wave Knight to make the presentation.